Copyright: © 2015 Möller K. This is an open-access article distributed under the terms of the Creative Commons Attribution License, which permits unrestricted use, distribution, and reproduction in any medium, provided the original author and source are credited. Obesity is well associated in various chronic diseases such as type 2 diabetes, hyperinsulinemia, dyslipidemia and atherosclerosis. Thus, for persons with obesity and diabetes, food with low GI are recommended in order to lower the glycemic response. The aim of this study was to examine the glycemic index (GI) and glycemic load (GL) of two formula diets, which are carbohydrate-rich (HC) or protein-rich (HP). Twenty healthy volunteers aged 25.8 ± 5.8 years (body mass index: weight/height2 =23.8 ± 2.4 kg/m2) randomly received either a reference food or amounts of the test food with equal carbohydrate content (45.9 g glucose / Portion) in three visits with at least 6 days between each intervention; resulted in a portion size of 76.2 g HC and 147.1 g HP. In order to determine plasma glucose and insulin concentrations, seven blood samples were collected (basal, 15, 30, 45, 60, 90 and 120 min after intake of the test foods). Satiety was reported on a visual analog scale during the test phase of two hours. In relation to glucose, a GI of 66.9 ± 41.8 was measured for HC formula diet and 7.1 ± 7.2 for HP formula diet. The GL of the HC serving portion was found to be 22.8 ± 14.3 and for HP 1.8 ± 1.9. This result indicates that HC can be classified as a medium GI food (55 - 69) and HP as low GI food (<55). In addition, self-reported hunger and satiety levels were more pronounced with HP compared to glucose (p<0.05). The GI and GL of the HP formula diet seemed to be more favorable and achieved good effects in view of a low glycemic response. Obesity has emerged as major global health problem. Approximately 1.9 billion adults are considered to be overweight and over 600 million were obese . It has been well established that obesity is associated with commonly occurring disorders such as hypertension, type 2 diabetes, hyperinsulinemia, dyslipidemia and atherosclerosis . Strategies for weight loss are considered with achieving a negative energy balance. Numerous nutritional approaches and diets with different proportion of proteins, carbohydrates and lipids, which may lead to energy restriction, are being investigated [3-5]. Formula diets as meal replacements have been accepted as useful therapeutic strategies for weight loss and weight maintenance . Furthermore, it has been proposed that the glycemic response of foods, which relates to its glycemic index (GI) and glycemic load (GL), can influence weight control [7,8]. The GI is a tool that can be used to classify carbohydrate-containing foods according to the glycemic response . The term GL was introduced to quantify the overall glycemic effect of food with respect to its specific carbohydrate content in typically consumed quantities . Diets with a high GI and high GL are connected with the development of coronary heart diseases [11-13]. This association appears to be stronger in participants with higher Body Mass Index and possibly those with type 2 diabetes [13,14]. The high glycemic response may lead to increased appetite, overeating and increased body mass and body fat . Contrary, recent studies suggested that low GI foods reduces hunger and results in a lower energy intake compared with high-glycemic index foods which finally leads to a positive weight management [16-18]. Moreover, diets with a low GI may help to control insulin secretion, postprandial glycaemia and to reduce triglycerides [19,20]. Therefore, diets with a low glycemic response are an effective opportunity for weight management and glycemic control. They represent a useful tool in the therapy of overweight and obesity . The GI is defined as the incremental area under the blood glucose curve (IAUC) after consumption of 50 g available carbohydrate from a test food. GI values are expressed as a percentage to the glycemic response observed after ingestion of the same amount of carbohydrates from a reference food (glucose) taken by the same subjects on a separate occasion [9,22]. The GI of a food is depending on the rate of ingestions. A high GI is caused by carbohydrates degraded quickly during ingestions . Therefore, glucose response is fast and high, whereas low GI is associated with complex carbohydrates due to their delayed and/or limited ingestions. A GI value is considered as high >70, medium (5522]. The GI is being depending on composition of food components (e.g. type of carbohydrates, fiber content, protein and fat) as well as the method of preparation [23-25]. This study was conducted to determine the GI of two different formula diets (meal replacements) - a carbohydrate-rich and a protein-rich – and describe the postprandial glucose metabolism. Additionally, self-reported postprandial satiety was measured. To determine the glucose and insulin effects of the formula diets, this randomized, crossover trial was conducted at the Institute of Food Sciences and Human Nutrition at Leibniz University of Hannover. Three visits were separated by 6 days wash-out phases. The study protocol was approved by the Ethical Committee of the Medical Chamber of Lower Saxony (Arztekammer Niedersachsen) on 21th November 2013. Written informed consent was obtained from all subjects according to the guidelines for Good Clinical Practice. Healthy, non-smoking, non-diabetic men and women were enrolled. The inclusion criteria for participation were an age between 18 and 50 years and a body mass index (BMI) between 18 and 28 kg/m2. Exclusion criteria were gastrointestinal disorders, suffering from diabetes, taking medications for any chronic disease conditions, being pregnant, breastfeeding, or having intolerances or allergies to any of the foods tested. In order to minimize fluctuations in fasting blood glucose and postprandial glucose response, subjects were instructed to maintain a 12 h overnight fast after consuming a delivered standard dinner (instant pasta dish), prior to each visit . Additionally, subjects were instructed to avoid alcohol or excessive exercise during the previous day. Two different formula diets were investigated in the study. Nutritional compositions are shown in Table 1. The formula diet classified as a carbohydrate-rich formula diet (HC) contained approximately 24% protein, 49% carbohydrate, 25% fat, and 2% fiber relating to the recommended preparation. The main components were isomaltulose (65%), soy protein isolate (26%), oligofructose (6.7%) and xanthan (1.3%). The macronutrient composition of the diet classified as protein-rich formula diet (HP) was approximately 38% protein, 34% carbohydrate and 28% fat. Here, the main components soy protein isolate (33%), whey protein isolate (32%) and fructose (32%) are contained. In order to ensure the comparability, a glucose solution was used as reference food because hereby all test foods had to be drunk. Each preparation was given as portions providing 50 g of available carbohydrates. This resulted in a portion size of 45.9 g glucose, 76.2 g HC and 147.1 g HP. The powders of all test foods were dissolved in 300 ml water. At each visit, fasting blood samples were taken to determine the baseline value (glucose and insulin); anthropometric parameters were also measured. After the first draw of fasting blood, subjects received the test foods to be investigated and the reference food in a randomized order. The subjects were instructed to consume the test foods within 5 minutes, together with 250 ml of water. Subsequent blood sample were taken 15, 30, 45, 60, 90, and 120 min after consumption. After 60 and 90 minutes, 250 ml of drinking water was consumed. Additionally, subjects filled in a visual analogue scale (VAS) questionnaire at 15, 30, 45, 60, 90, and 120 min to assess the postprandial satiety. Anthropometric measurements were taken at each visit. BMI was calculated as weight (kg)/height2 (m²). Fasting blood samples were collected by venipuncture of an arm vein using sealed Blood Collection Tubes and System S-Monovettes® (Sarstedt, Germany). After each draw, the blood samples were immediately cooled to 4-6 °C in order to prevent breakdown of the blood glucose in the blood collection tubes. The blood samples were refrigerated and sent to external laboratories (LADR laboratory, Hannover, Germany) for the measurement of clinical parameters. The blood glucose concentration was measured in 2.4 ml of venous sodium fluoride whole blood. Measurements were performed by using the hexokinase method, an ultraviolet (UV) enzymatic (in vitro) assay (Beckman Coulter, Inc.). The insulin concentration was measured in 2.7 ml of serum and determined by immunoassays (cobas®, Roche Diagnostics, Mannheim, Germany). HbA1c was measured in EDTA whole blood using ion exchange chromatography (Bio-Rad Laboratories, Germany) which is by means of high-performance liquid chromatography (HPLC). VAS questionnaire was based on five lines of 100 mm in length with words anchored at each end, reporting the most positive and the most negative rating of each question as described elsewhere . Subjects were asked about the desire to eat, hunger, satiety, and prospective food consumption (PFC). Quantification was done by measuring the distance (mm) from the left end of the line to the mark. GI measurement was in accordance with ISO 26642, Food Products – Determination of the glycemic index and recommendation for food classification . The IAUC for blood glucose and insulin response as well as satiety values were calculated geometrically using the trapezoid rule, the area below the baseline was ignored . To calculate the IAUC, the raw data of glucose and insulin concentration were used and determined for each subject as well as for the three test foods. To calculate glucose and insulin concentrations as well as satiety values at the various time points, the raw data were adjusted for baseline value. The GI for each test food was calculated as follows: GI=(IAUC test food/IAUC glucose)*100. The GL is defined as the product of the GI of a food and the amount of available carbohydrates in a serving portion. The GL was calculated as follows: GL=(GI * available carbohydrate in one serving portion size (g))/100. The final reported GI and GL was shown as mean value ± standard deviation for the test food. Normality of variables was tested by Kolmogorov-Smirnov test. In case of normal distribution, analysis was performed by using multiple comparisons with analysis of Variance (ANOVA) and Post hoc test (Bonferroni); in case of abnormally distributed data Kruskal-Wallis-Test followed by Mann-Whitney U-Test was used. Differences were considered significant at p<0.05. Analysis was carried out using the Statistical Package for Social Sciences SPSS 21 software (SPSS Inc., Chicago, IL, USA). Nine healthy men and eleven women (BMI 23.8 ± 2.4 kg/m2; age 25.8 ± 5.8 years) were enrolled in the study. Baseline characteristics are shown in Table 2. Parameters of glucose metabolism (fasting glucose, fasting insulin) were within the reference range for all subjects and did not provide any signs of physiological impairment. Due to the crossover study design, baseline levels were not significantly different between the treatment groups. The data of all 20 subjects were included in the glucose metabolism and GI as well as satiety evaluation. The mean GI calculated for HC was 66.9 ± 41.8, for HP 7.1 ± 7.2 and for glucose as reference 100 ± 0 (Table 3). The mean GL value for HC was 22.8 ± 14.3 and for HP 1.8 ± 1.9. GI of the test foods were statistically significant different (p<0.001, Post hoc test) whereby GI of HC and HP were significantly lower (p<0.001, Post hoc test) than for glucose. Furthermore GI and GL of HC was significantly higher (p<0.001, Post hoc test) than HP. The maximal blood glucose concentration (cmax) were statistically significant different (p<0.001, ANOVA) between the three test foods, where cmax glucose of the test foods was significantly lower (p<0.001, Post hoc test) after consumption of glucose. The time to reach the maximal glucose concentration (tmax) was 27.0 ± 10.4 min for HC, 18.0 ± 6.2 min for HP and 24.0 ± 10.1 min for glucose. The time to reach the maximal glucose concentration (tmax) between the treatment groups were significantly different (p=0.011, ANOVA). In general, tmax glucose was significant higher after consumption of HP than HC (p=0.038, Mann-Whitney U test) and glucose (p=0.003, Mann-Whitney U test). The blood glucose curves after glucose and test food consumption are shown in in Figure 1. The cmax insulin was significantly higher for HC (Post hoc test p<0.001) and for HP group (post hoc test p=0.002) compared to glucose. Serum insulin curves after test food consumption showed different courses (Figure 2). No abnormal findings were seen in the subjects' glucose metabolism, which reconfirms that subjects were healthy. With regard to the satiety assessment, in all satiety variables (desire to eat, hunger, satiety, and prospective food consumption) significant differences (p<0.05) between the treatment groups were found. The mean average hunger IAUC and satiety IAUC showed that HP led to the greatest feelings of satiety and the slightest feelings of hunger (IAUC satiety 4475.3 ± 4020.4 mm*h, IAUC hunger 435.9 ± 745.4 mm*h) over the 120 min post-ingestion period, followed by HC and glucose. After consumption of HP, hunger and satiety were significantly different to glucose (Post hoc test for satiety p=0.003; Mann-Whitney U test for hunger p=0.005). The minor desire to eat as well as the minor prospective food consumption was found in the HP group, followed by HC and glucose. The results for postprandial hunger and satiety score are summarized in Table 4 and Figure 3A and 3B. The graphs showed that feelings of satiety persists about 120 min and was not achieved baseline. In either case glucose produced slightest satiety which persists only short term. The purpose of this study was to determine the glycemic response of two formula diets in a healthy population. The calculated GI and GL of HP formula diet (7.1 ± 7.2 and 1.8 ± 1.9) was considerably lower compared to HC formula diet (66.9 ± 41.8 and 22.8 ± 14.3). Therefore, only the HP formula diet can be classified as a low GI food (<55) and low GL food (≤10). Though close to 70, the HC formula diet has to be classified as medium GI (55 to 69) and high GL (≥20) food product [22,29]. This difference in calculated GI and GL of HC demonstrate that the relationship between both is not straightforward and GL is dependent upon portion size . A lower GL might be achieved by a smaller portion size of HC formula diet. However, these findings are in accordance with measured GI values for meal replacement and weight management products such as formula diets or bars ranging from 5 to 73 for GI and 1 to 26 for GL . Several food factors have been identified that influence absorption of glucose and therefore potentially the GI of a food. Some of these factors include: the food-matrix, processing, macronutrient and fiber content [23,24]. Carbohydrate ingredients such as glucose, maltodextrin or sucrose are predominantly rapidly digested carbohydrates which induce a relatively high glycemic and insulinemic response. The possibility to modify the glycemic impact of foods is by substitution rapidly digested carbohydrates by low glycemic carbohydrate alternatives . The ingredient isomaltulose in HC formula diet constitutes such an alternative carbohydrate. With a calculated glycemic index of 32, is isomaltulose a low glycemic carbohydrate  and a natural reducing disaccharide compound of α-1,6-linked glucose and fructose. Studies have shown that isomaltulose intake decreases the postprandial rise in plasma glucose and insulin levels in healthy  and overweight subjects . In addition, the ingredient fructose in HP formula diet provides an alternative carbohydrate, which does not acutely raise blood glucose, nor stimulate insulin secretion . Accordingly, in the present study HC and HP formula diet attributed slower rates of postprandial response than the digestion of glucose. Nevertheless, the significant higher cmax glucose concentration after consumption of HC indicates a markedly glucose response compared to HP, which might be caused by containing isomaltulose, a source of glucose, in HC formula diet. Further, the presence of indigestible carbohydrate such as fiber in food products may lower postprandial glycaemia and has been shown to reduce GI of a meal . Therefore, it could has been assumed, that the presence of ingredients such as oligofructose in the HC formula diet may influence the glycemic response and may also contribute to a lower GI. Oligofructose, an inulin-type of fructan, is a non-digestible fully soluble and fermentable carbohydrate, with known prebiotic properties . Accordingly, it has been shown that the IAUC for plasma glucose concentration was significantly lower after consumption of fructan compared to a totally digested carbohydrate . Therefore, fructan also modulates the postprandial glucose response and could be a useful tool for controlling glucose homeostasis . However, the oligofructose content of the HC formula diet was insufficient to contribute a low GI. In contrast, the low GI and GL of HP formula diet might be partly attributed to its ingredients as whey protein isolate and soy protein isolate. Studies have shown that the addition of whey to meals stimulates insulin production, which in turn affects blood glucose clearance [37-39]. Accordingly, the significant higher cmax insulin and lower cmax glucose concentration after consumptions of HP formula diet indicates enhanced insulin release and reduced postprandial blood glucose compared to other test foods. However, the GI and GL were calculated by measured glucose, therefore the lacking of glucose source in HP formula diet apart of fructose might be a further reason for low GI. Low glycemic foods are considered as favorable diet to contribute a prolonged feeling of satiety . Further, short-term studies suggested that low-glycemic index diets could delay hunger and decrease subsequent energy intake compared with high glycemic index foods . There was a larger IAUC for subjective feelings of satiety after intake of HP formula diet compared to HC formula diet. Consistently, the IAUC hunger was smaller after intake of HP formula diet. Therefore, both contrary questions referring to hunger and satiety seem to be good assessable. In the regulation of food intake also postprandial glucose and insulin levels may play certain roles, which suggest that high insulin concentration indicates satiety . Therefore the analyzed data by VAS appears to agree with measured postprandial blood glucose and insulin concentration to a large extent. However, the larger volume of HP formula diet could possibly associate with decreased hunger and increased satiety . In addition, the lower volume of HC formula diet portion could accelerate transit through the stomach and intestine and may lead to reduced stimulation satiety signals [44,45]. Nutritional macronutrients can influence satiety as well. A hierarchy of macronutrient satiating effects has been observed that protein being the most satiating followed by carbohydrates and fat at least . It has been shown that soy protein and whey protein products enhance satiety [47,48] which may reduce energy intake . Moreover evidence suggests that the consumption of fructan such as oligofructose is associated with lowered subjective hunger ratings and tendency to increases the concentration of satiety hormones . Based on the nutritional ingredients of both formula diets it would be expected that HC as well as HP formula diet have the same satiating effect. The present results, however, confirm higher satiating effects by higher protein content in a diet. Some research has shown that diets based on low glycemic foods have beneficially influence on body weight and body composition [7,51]. Providing a comparable energy intake, low glycemic index food diets may stimulate more weight loss in obese people than high glycemic index diets . In contrast to this, we demonstrated no difference after consumption of low glycemic formula diet and moderate glycemic formula diet on weight loss and energy intake . Our results suggest that the macronutrient compositions of meal replacements are less crucial for the efficacy of formula diets. Therefore, the most important factor influencing weight loss caused by HC and HP formula diet can be attributed to a reduced energy intake . The present data show that the protein-rich formula diet is a low-GI and low-GL food and the carbohydrate-rich formula diet can be classified as moderate-GI and high-GL food. In view of postprandial glucose metabolism HP formula diet might be useful for meal replacements in diets to induce lower blood glucose and insulin response. With regard to the favorable effects of low glycemic response food, the HP formula diet achieved good effects in view of a low glycemic response. The provision of the test products by Certmedica International GmbH (Aschaffenburg, Germany) is kindly acknowledged. The authors are solely responsible for the design and conduct of the study, collection, management, analysis, and interpretation of the data, as well as preparation of the manuscript. All authors had full access to the data and take responsibility for its integrity. All authors have read and agree with the manuscript as written. We would like to thank the participants who contributed their time to this project. 1 World Health Organization 2015. 2Wilson PW, D'Agostino RB, Sullivan L, Parise H, Kannel WB (2002) Overweight and obesity asdeterminants of cardiovascular risk: the Framingham experience. Arch Intern Med 162: 1867-72. 3Abete I, Astrup A, Martínez JA, Thorsdottir I, Zulet MA (2010) Obesity and the metabolic syndrome: role of different dietary macronutrient distribution patterns and specific nutritional components on weight loss and maintenance. Nutr Rev 68: 214-31. 4Sacks FM, Bray GA, Carey VJ, Smith SR, Ryan DH, et al. (2009) Comparison of weight-loss diets with different compositions of fat, protein, and carbohydrates. N Engl J Med 360: 859-73. 6Keogh JB, Clifton PM (2005) The role of meal replacements in obesity treatment. Obes Rev 6: 229-34. 7 Thomas D, Elliott EJ, Baur L (2007) Low glycemic index or low glycemic load diets for overweight and obesity. Cochrane Database Syst Rev 18: 1-40. 8De Rougemont A, Normand S, Nazare JA, Skilton MR, Sothier M, et al. (2007) Beneficial effects of a 5-week low-glycemic index regimen on weight control and cardiovascular risk factors in overweight non-diabetic subjects. Br J Nutr 98: 1288-98. 9 Jenkins DJ, Wolever TM, Taylor RH, Barker H, Fielden H, et al. (1981) Glycemic index of foods: a physiological basis for carbohydrate exchange. Am J Clin Nutr 34: 362-6. 10Salmeron J, Ascherio A, Rimm EB, Colditz GA, Spiegelman D, et al. (1997) Dietary fiber, glycemic load, and risk of NIDDM in men. Diabetes Care 20: 545-50. 12Fan J, Song Y, Wang Y, Hui R, Zhang W (2012) Dietary glycemic index, glycemic load, and risk of coronary heart disease, stroke, and stroke mortality: a systematic review with meta-analysis. PloS One 7: e52182. 13 Barclay AW, Petocz P, McMillan-Price J, Flood VM, Prvan T, et al. (2008) Glycemic index, glycemic load, and chronic disease risk-a meta-analysis of observational studies. Am J Clin Nutr 87: 627-37. 14Mirrahimi A, Chiavaroli L, Srichaikul K, Augustin LSA, Sievenpiper JL, et al. (2014) The role of glycemic index and glycemic load in cardiovascular disease and its risk factors: a review of the recent literature. Curr Artheroscler Rep 16: 381. 15Roberts SB (2000) High-glycemic index foods, hunger, and obesity: Is there a connection? Nutr Rev 58: 163-9. 16 Warren JM, Henry JK, Simonite V (2003) Low Glycemic Index Breakfasts and Reduced Food Intake in Preadolescent Children. Pediatrics 112: 414-9. 17 Roberts SB (2003) Glycemic index and satiety. Nutr Clin Care 6: 20-6. 18Brand-Miller J, McMillan-Price J, Steinbec K, Caterson I (2009) Dietary glycemic index: Health implications. J Am Coll Nutr 28: 446-9. 19Pereira MA, Swain J, Goldfine AB, Rifai N, Ludwig DS (2004) Effects of a low-glycemic load diet on resting energy expenditure and heart disease risk factors during weight loss. JAMA 292: 2482-90. 20Ekmekcioglu C, Touitou Y (2011) Chronobiological aspects of food intake and metabolism and their relevance on energy balance and weight regulation. Obesity reviews 12: 14-25. 21Schwingshackl L, Hoffmann G (2013) Long-term effects of low glycemic index/load vs. high glycemic index/load diets on parameters of obesity and obesity-associated risks: A systematic review and meta-analysis. Nutr Metab Cardiovasc Dis 23: 699-706. 22 FAO (1998) Carbohydrates in human nutrition. Report of a Joint FAO/WHO Expert Consultation. FAO Food Nutr Pap 66: 1-140. 23Bjorck I, Granfeldt Y, Liljeberg H, Tovar J, Asp NG (1994) Food properties affecting the digestion and absorption of carbohydrates. Am J Clin Nutr 59: 699-705. 24Brand JC, Nicholson PL, Thorburn AW, Truswell AS (1985) Food processing and the glycemic index. Am J Clin Nutr 42: 1192-6. 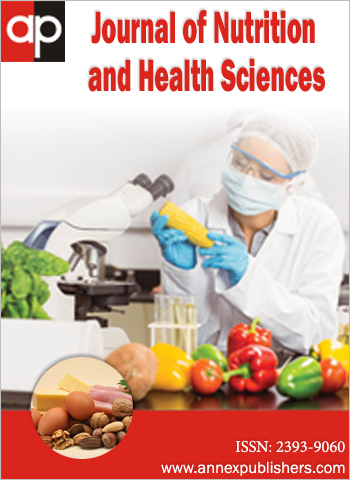 25ISO 26642 (2010) Food products - Determination of the glycemic index (GI) and recommendation for food classification. ISO 26642: 2010 (E). 26Granfeldt Y, Wu X, Bjorck I (2006) Determination of glycemic index: some methodological aspects related to the analysis of carbohydrate load and characteristics of the previous evening meal. Eur J Clin Nutr 60: 104-12. 27Flint A, Raben A, Blundell JE, Astrup A (2000) Reproducibility, power and validity of visual analogue scales in assessment of appetite sensations in single test meal studies. Int J Obes Relat Metab Disord 24: 39-48. 28Wolves TM (2004) Effect of blood sampling schedule and method of calculating the area under the curve on validity and precision of glycemic index values. Br J Nutr 91: 295-301. 29Venn BJ, Grenn TJ (2007) Glycemic index and glycemic load: measurement issues and their effect on diet-disease relationships. Eur J Clin Nutr 61: 122-31. 30 Atkinson FS, Foster-Powell K, Brand-Miller J (2008) International Tables of Glycemic index and Glycemic load values: 2008. Diabetes Care 31: 2281-3. 31 Holub I, Gostner A, Theis S, Nosek L, Kudlich T, et al. (2010) Novel findings on the metabolic effects of the low glycemic carbohydrate isomaltulose (Palatinose). Br J Nutr 103: 1730-7. 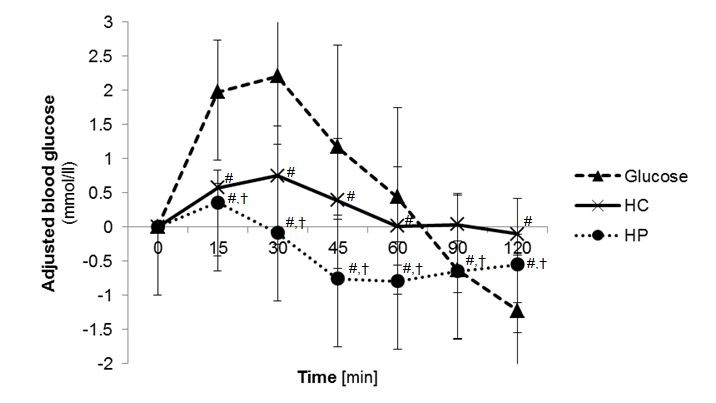 32van Can JG, Ijzerman H, van Loon LJ, Brouns F, Blaak EE (2009) Reduced glycemic and insulinaemic responses following isomaltulose ingestion: implications for postprandial substrate use. Br J Nutr 102: 1408-13. 33 Segal SS, Gollub E, Johnson RJ (2007) Is the fructose index more relevant with regard to cardiovascular disease than the glycemic index? Eur J Nutr 46: 406-17. 34Livesey G, Taylor R, Hulshof T, Howlett J (2008) Glycemic response and health- a systematic review and meta-analysis: the database, study characteristics, and macronutrient intakes. Am J Clin Nutr 87: 223-36. 35Cherbut C (2002) Inulin and oligofructose in the dietary fiber content. Br J Nutr 87: 159-162. 36 Cani PD, Lecourt E, Dewulf EM, Sohet FM, Pachikian BD, et al. (2009) Gut microbiota fermentation of prebiotics increases satietogenic and incretin gut peptide production with consequences for appetite sensation and glucose response after a meal. Am J Clin Nutr 90: 1236-43. 37Fird AH, Nilsson M, Holst JJ, Bjorck IM (2005) Effect of whey on blood glucose and insulin responses to composite breakfast and lunch meals in type 2 diabetic subjects. Am J Clin Nutr 82: 69-75. 38 Peterson BL, Ward LW, Bastian ED, Jenkins AL, Campbell J, et al. (2009) A whey protein supplement decreases post-prandial glycemia. Nutr J 8: 47. 39Gunnerud UJ, Ostman EM, Bjorck IM (2013) Effects of whey proteins on glycaemia and insulinaemia to an oral glucose load in healthy adults; a dose–response study. Eur J Clin Nutr 67: 749-53. 40 Roberts SB (2003) Glycemic index and satiety. Nutr Clin Care 6: 20-6. 41Siu PM, Wong SH (2004) Use of the glycemic index: effects on feeding patterns and exercise performance. J Physiol Anthropol Appl Human Sci 23: 1-6. 42 Flint A, Gregersen NT, Gluud LL, Moller BK, Raben A, et al. (2007) Associations between postprandial insulin and blood glucose responses, appetite sensations and energy intake in normal weight and overweight individuals: a meta-analysis of test meal studies. Br J Nutr 98: 17-25. 43Rolls BJ, Roe LS, Meengs JS (2007) The effect of large portion sizes on energy intakes is sustained for 11 days. Obesity 15: 1535-43. 44 DiMeglio DP, Mattes RD (2000) Liquid versus solid carbohydrate: effects on food intake and body weight. Int J Obes Relat Metab Disord. 24: 794-800. 45 Mattes RD, Campbell WW (2009) Effects of Food Form and Timing of Ingestion on Appetite and Energy Intake in Lean Young Adults and in Young Adults with Obesity. J Am Diet Assoc 109: 430-7. 46Pan A, Hu FB (2011) Effects of carbohydrates on satiety: differences between liquid and solid food. Curr Opin Clin Nutr Metab Care 14: 385-90. 47Veldhorst MA, Nieuwenhuizen AG, Hochstenbach-Waelen A, Westerterp KR, Engelen MP, et al. (2009) Effects of high and normal soyprotein breakfasts on satiety and subsequent energy intake, including amino acid and 'satiety' hormone responses. Eur J Nutr 48: 92-100. 48Veldhorst MA, Nieuwenhuizen AG, Hochstenbach-Waelen A, van Vught AJ, Westerterp KR, et al. (2009) Dose-dependent satiating effect of whey relative to casein or soy. Physiol Behav 96: 675-82. 49Zafar TA, Waslien C, AlRaefaei A, Alrashidi N, AlMahmoud E (2013) Whey protein sweetened beverages reduce glycemic and appetite responses and food intake in young females. Nutr Res 33: 303-10. 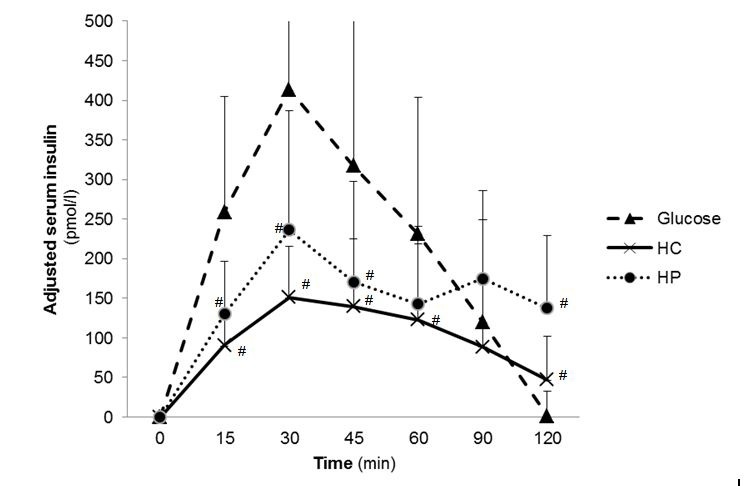 50Verhoef SP, Meyer D, Westerterp KR (2011) Effects of oligofructose on appetite profile, glucagon-like peptide 1 and peptide YY3-36 concentrations and energy intake. Br J Nutr 106: 1757-62. 51Brand-Miller JC, Holt SH, Pawlak DB, McMillan J (2002) Glycemic index and obesity. Am J Clin Nutr 76: 281-5. 52 Moller K, Willers J, Hahn A (2015) Efficacy of high carbohydrate versus high protein meal replacements on weight reduction - a randomized controlled trial, J Obes Weight Loss Ther 5: 266.
m=9, w=11 Mean ± SD Min. - Max.